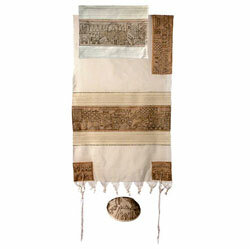 Hand embroidered Prayer Shawl (Tallit) by Yair Emanuel. in silver, with elements from the old-city of Jerusalem. Matching bag and kipa included.